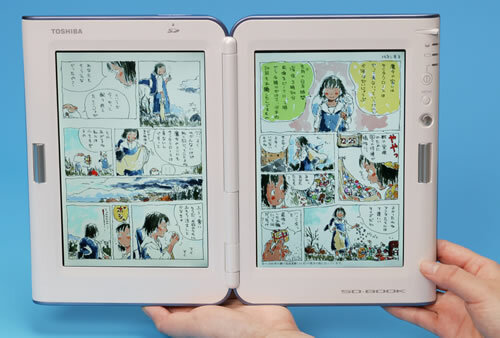 This unique electronic book has two LCD displays in a very familiar configuration. You have your favorite book open before you, and read it without ever turning a page. The main advantage of an e-book like this is that you have more screen real estate to work with. "As easy to hold as a paperback, whether standing, sitting or lying down, the SD-BOOK incorporates two high-resolution, 7.7-inch low temperature polysilicon LCDs that offer the fine detail necessary for image reproduction and comfortable reading of text. High level security suits the SD-BOOK for both B2C and B2B applications, including mobile e-learning, security control and content distribution." The usability advantages of a regular book are that you can see all of it in your hand; you can see how many pages there are, how many illustrations. You can see, at any given moment, how much is left. See the discussion for runcible to see the advantages of having an e-book with hundred's of paper-thin panels. See also this interesting discussion - Evaluating the Usability of Portable Electronic Books.